Notes: Began in Old Town Feb. 1879 by Anton O. Bakken (see Mt. Horeb Creamery), later moved to 8th St. 1901 incorporated as Mt. 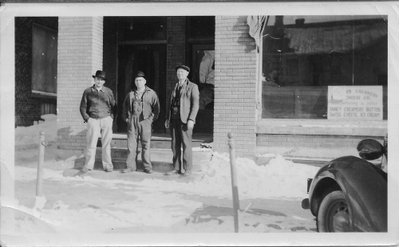 Horeb Cooperative Creamery and Cheese Co, James Reilly Pres., Lewis Eggum Sec./Tres. 1910 Leever? Eggum, Tres. 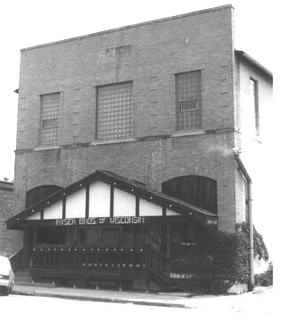 In 1916 moved to new brick building on S. 2nd St. In 1933 expanded into a new building to make round Swiss cheese which opened Mar. 15, 1934. Newspaper article states that Albert J. Baker pres. and manager when sold at public auction to Adolph & Werner Ryser. [In History of Mt. 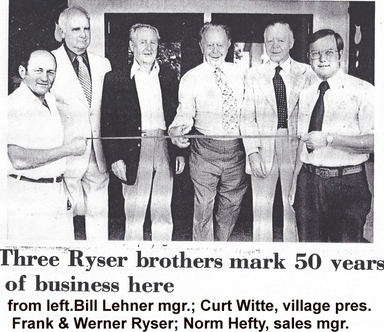 Horeb Rysers bought factory in 1945]. 1900- to at least 1902 Schmidt, mgr. Wisconsin Historical Society, Wisconsin Architecture and History Inventory- Architectural Style: Boomtown. Wall Material: Cream Brick. Bavarian look 1/2 timbered entry added in 1979. Brickwork details. Architectural Style: Neoclassical. 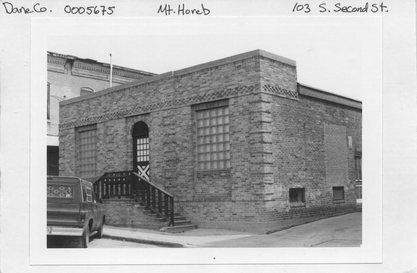 In 1916, the Mount Horeb Creamery and Cheese Company constructed a brick building on the corner of South Second Street and Front Street on the former site of the Herman Dahie Ice House (now site of Grumpy Troll Brewery). Most of the dairy farmers in the area were patrons and hauled milk to the creamery in horse drawn wagons. 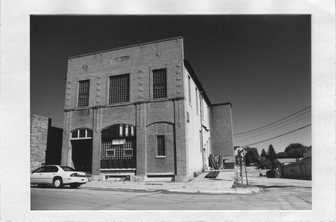 Over time, the company expanded, and a new building next door enabled the production of Swiss cheese. Over 30,000 pounds of milk were processed each day. 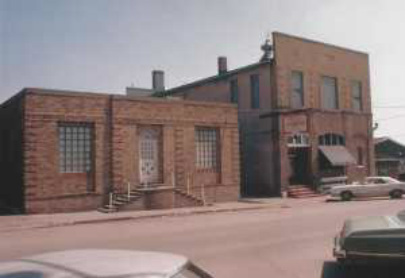 In 1945, the building was sold to the Ryser Brothers Cheese Company who manufactured cheese in this location for over 40 years. When the business closed, the building sat vacant for several years. 1940. 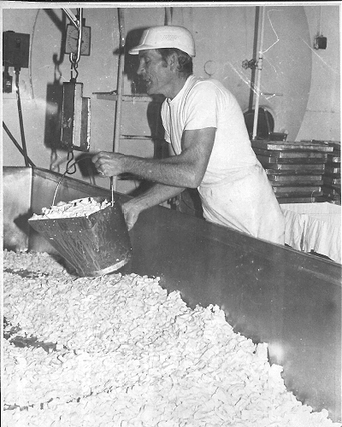 Paul Ramshire- cheesemaker, Les Kahl- buttermaker, C.A. Fink- office. Sign in the window -"Mt. Horeb Creamery & Cheese Co. , Manufacturing & Sales, Fancy Creamery Butter, Swiss Cheese, Ice Cream." Mt. 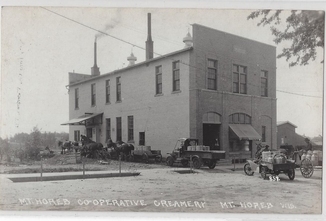 Horeb Co-Operative Creamery on 2nd st.